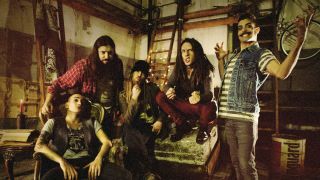 The Italian metallers go unplugged! Mere hours after announcing their intention to tear Bloodstock a new one (we imagine they said that, they probably didn’t), Destrage have given us this exclusive video! Filmed live at RecLab Studio late last year, we’ve got this special acoustic performance of the track Where The Things Have No Colour – taken from their album Are You Kidding Me? No.. Speaking about the video, the band say: “Where The Things Have No Colour has a very personal meaning to us. This song talks about certain moments, it’s hard to explain them but if you felt like this once in your life you will find the lyrics extremely familiar. We talked a lot about the possibility of making an acoustic version of one of our songs, and this felt like being the perfect occasion.